Voting is now open for Preston’s ‘Smiles Better Awards’ 2019. Members of public can vote for their high street heroes with the awards taking place for the fourth year. Last year saw the awards attract international media attention when the Fishergate Bollard was nominated for an award. The 2018 awards attracted more than 200 nominees and 98,000 public votes. BID Manager Mark Whittle said: “The awards are a great opportunity for city centre businesses to take the limelight. 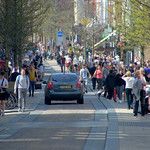 “We have a vibrant city centre that continues to grow and improve, offering something for everyone. “The city centre has a reputation for offering outstanding service and these awards are staged purely to recognise those businesses that excel by keeping Preston’s customers happy and returning time after time. “We would encourage everyone to go online and vote for their favourite shops, leisure venues and people”. Last year’s ceremony at The Guildhall saw former leader of Preston City Council, Peter Rankin, awarded the special recognition prize for his services to the city. Over 300 guests were treated to dinner before the award’s ceremony followed by a special appearance from TV star Sherrie Hewson of Coronation Street, Benidorm and Carry On fame. Babs Murphy, Chief Executive of the NWL Chamber of Commerce, sponsors of the Smiles Better Awards said: “The Smiles Better Awards play an important role in highlighting the amazing achievements of our city centre businesses and the people behind them. “They have a lot to be proud of”. Voting opens on February 1st and closes on February 28th at 5.00pm.